To the one I hold closest to my heart, now and always. To the one who understands my unspoken words by merely a glance. To the one who makes my world brighter and love-filled just by being here with me. To my best friend, my soul mate and the one who holds the key to my heart, now and always...I wish you a very blessed and HAPPY BIRTHDAY B! 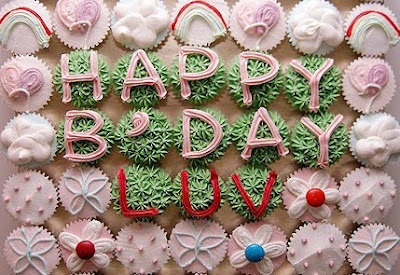 Happy birthday to your beloved B.
such inspiring words to accompany the cupcakes. i'm sure B is touched with this lovely post. hope his birthday is filled with love, joy and perfect in every way. have a great weekend with B. Happy birthday to you Mr B! May all your wishes be fulfilled! Recent blog:=- The Clueless Plumber?? happy birthday to the love of your life B!! i wish you both all the best not just for B! Recent blog:=- Proof Pawsitive: Dogs CAN Talk! oh the cupcakes birthday cake is gorgeous!! I want the whole bottom row!!!! Recent blog:=- What a WOW Weekend! i just saw yr msg, u got food poisoning?! =-O =-O =-O how are you feeling now sweetie? Hey sweetie, welcome back! U must try, yummy la but expensive oso… here are more cupcakes for u Mon, enjoy! Happy Birthday to a great guy. What a sweet post for him. This is such a sweet post, GP! Here's wishing B, belatedly, EVERYTHING Sweet, sweet, Nice, nice and lots of Happiness to him on hisr Birthday. Hi Jackie, still with EC for now…I see u have left EC for real this time?? Thanks for the birthday wish sweetie, love ya!